A satellite image shows Hurricane Florence spinning in the Atlantic Ocean Monday morning, Sept. 10, 2018. A coastal North Carolina county on Monday issued a mandatory evacuation order for its entire population as Hurricane Florence strengthened to a Category 4 storm and continued its slow but angry dance toward the U.S. East Coast. 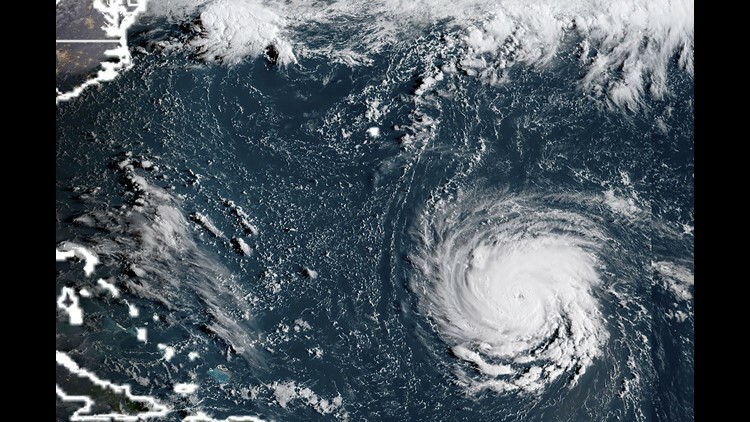 The National Hurricane Center said Florence is expected to slam into the coast around North and South Carolina as a Category 3 or 4 hurricane on Thursday or Friday. The storm's winds had increased to 130 mph on Monday. The hurricane roared from a Category 1 (90 mph) to a Category 4 (130 mph in just the past 13 hours, an extremely rapid intensification, according to Colorado State University meteorologist Phil Klotzbach. 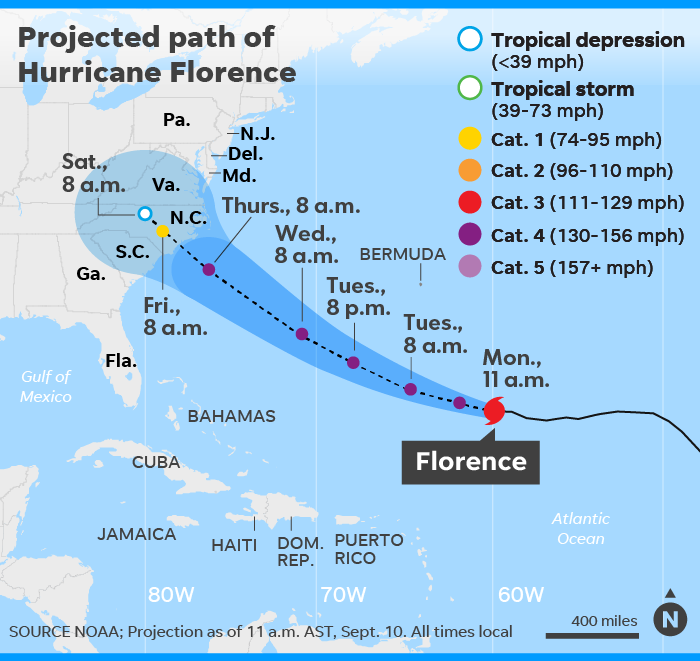 "The last Atlantic hurricane to intensify as rapidly as far north as Florence's current location was Hurricane Humberto in 2007," he said. 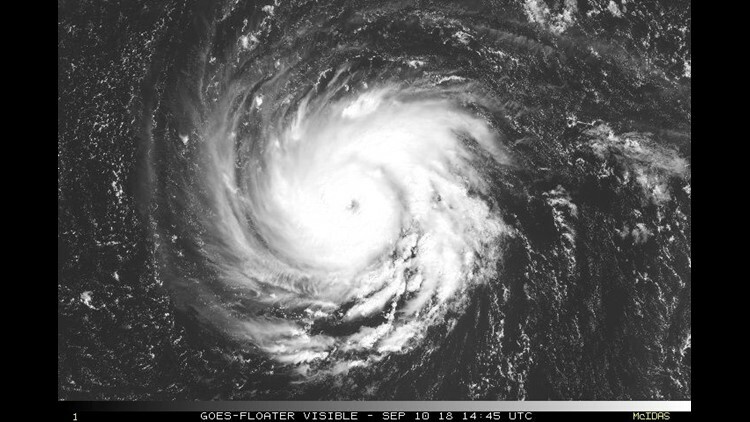 A satellite image taken the morning of September 10, 2018, shows Hurricane Florence off the US East Coast in the Atantic Ocean. Dare County has a year-round population of more than 30,000 people, but the population balloons during tourist seasons. It was not immediately clear how many people were being evacuated. A "major" hurricane is one with sustained winds of more than 110 mph. Any Category 3, 4, or 5 hurricane is classified as a major hurricane. The hurricane center warned that the swells are likely to cause "life-threatening" surf and current conditions. Even before the evacuation order, Dare County emergency officials warned that rough seas and strong rip currents are already creating dangerous conditions. "Red, no swimming flags are flying and everyone must stay out of the water," Dare County Emergency Management Director Drew Pearson said. Some portions of the Carolinas could see as much as 30-40 inches of rain from Florence, the National Weather Service said, which would lead to river flooding that "could last for days or weeks" after the storm. The Weather Channel warned of a "disastrous" level of flooding for parts of the area. Virginia, North and South Carolina have declared states of emergency ahead of the storm.